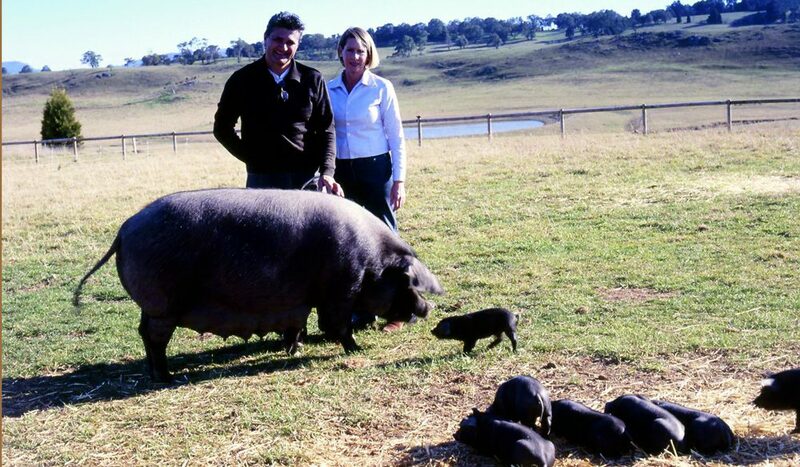 Pasquale Mutari and Cindy Bowman with potbelly pigs - beware, they bite, the pigs that is. In a tucked-away corner of NSW, our Gourmet Guy has one of the single greatest meals he’s ever sat down to. Also, he’s bitten by a pig. A mixed result, to be sure . . .
It’s a rare experience to eat sun-warmed raspberries off their canes, to see a rainbow through black thunderclouds over a vineyard, to be bitten on the big toe by one of the world’s most endangered pigs and to have one my most memorable country meals all in the same day. I hadn’t been to the NSW Southern Highlands in a long while, recollections of too many tweed twin sets and an excess of twee souvenir shops having kept me away. If I was to shift my jaded perceptions, it was time to observe firsthand the region’s changing food and wine scene. Several berry farms vie for attention in the Highlands but somehow I got lucky and chose well. I made an appointment to visit Cuttaway Creek Raspberry Farm (Old Hume Hwy, Mittagong,  4871 1201), from where owner Dave Penn sells direct to some of Sydney’s more illustrious restaurants. The berries you eat at a fine diner are usually very different from those purchased at your local greengrocer or supermarket. The latter are often picked under-ripe or (worse) have begun to ferment in their settled juices at the bottom of the container, nasty in all respects. To savour berries fresh from the orchard is a sweet revelation. Dave picks in the morning and sells the punnets almost immediately. If you’re not a restaurateur on his delivery list, I recommend a visit to Cuttaway Creek, where there’s a farm-door sales outlet. Apart from the fresh fruit, he also does the best raspberry jam I’ve yet to eat and a splendid raspberry vinegar. The rainbow occurred during a visit to Joadja Vineyards and Winery (Cnr Greenhills and Joadja Roads, Berrima,  4878 5236, www.joadja.com). Planted in the early ’80s (the district’s first winery), owner Kim Moginie was definitely a pioneer when he planted Cabernet Sauvignon, Sauvignon Blanc and Malbec. Its 15 acres also include some Sangiovese. I tasted barrel samples of all, the standouts being the 2005 Sauvignon Blanc and Malbec, a 2004 Sangiovese and a dense 2002 Cabernet Sauvignon developing in some very old barrels. I also sampled some “balsamic” vinegar composed of a blend of red varieties that in a few more years will result in one of Australia’s best. Joadja’s cellar door is surely one of Australia’s most charming, reminding me a little of Rockford’s in the Barossa Valley with its heritage appeal. The wines from the cellar door are a mixed lot, some disappointing, some showing up well. I leave it to the visitor to decide, although I suspect some dirty barrels need replacing; a few wines fell flat. If they safely bottle the barrel samples I tried, however, then Joadja is assuredly a winery to watch again. The Malbec is one of the best I’ve had anywhere; same goes for the Sauvignon Blanc. Extremely rare Large Black English piglet “Oink” is indeed a cute little pig. I climb over the fence to join him with his cousins. He immediately rolls onto his back to have his tummy scratched. While I pay attention to Oink, one of his paddock mates takes an interest in my left big toe and clamps down hard on it. “Watch out. They love feet,” says Cindy, rather too late. Cindy sells almost all of her pork to her local butcher, Graeme O’Donnell, at his Moss Vale Butchery ( 4868 1026), though her next crop will probably exceed what Graeme will be able to sell locally. Cindy’s property (Highlands Heritage Pork,  4868 2509, hhpork@bigpond.net.au) isn’t really open to the public, but with prior notice she’s more than happy to take visitors on a tour. Be sure to say hello to Oink . . . and of course to wear closed shoes. Note: The following review of a single meal at the Journeyman Restaurant (Old Hume Hwy, Berrima,  4877 1911), while entertaining, is really only for those with an exceedingly specialised interest in food and wine as a gourmet experience. I understood perhaps a third of it. Best of luck. – Ed. The Journeyman Restaurant came highly recommended. It employs the only sommelier in the Highlands, and I thought a sommelier’s advice on the local wine scene would be useful. I learned that the sommelier, Debbie Pearce-Pratt, is married to Tim Pratt, the chef, and together they own the Journeyman. I discussed the Tasting Menu with Debbie and asked her to alter the matched wines slightly to include more locals from her compendious list of more than 300 from around the world. Delightfully, she changed her recommendations, then told me that (because we were taking such an interest) Tim would probably “add a few more little sample dishes” to our degustation of seven courses. We started with a demi-tasse of puree of mushroom soup with horseradish cream, followed by a single Hastings River rock oyster with an apple balsamic vinegar, accompanied by a Cantine Pra Soave Classico Superiore 2004. Not exactly local, but very good all the same. A stunning terrine of orange-cured ocean trout, sour cream and chives with a beetroot and orange salad, and a porcini mushroom and ricotta-filled zucchini flowers, slow roast tomato and salsa verde were accompanied by the local Greenbriers Park Sauvignon Blanc 2004. Again, a lovely match of flavours and by then I was growing increasingly enthused by Tim’s talent in the kitchen. A sublime galantine of orange and vanilla stuffed spatchcock, apple and pomegranate salad almost matched the St Hubert’s Rousanne 2003 – the complexity of the galantine outdid the Rousanne but I liked the novelty of the pairing anyway. After a short break we progressed to fig-stuffed saddle of lamb, bubble and squeak and pumpkin puree with a Castello di Gabbiano Riserva Chianti Classico 2000. Match, game, set and win with this one. Tannin and fat, sweet and salty, lovely Chianti with legs performs with young lamb. My eyes started to roll back into my head. Next up was a roast rump of wagyu beef, fondant potato and Perigueux sauce with Wolf Blass Grey Label Cabernet Sauvignon 2003. The sauce was divine; little morsels of foie gras floating in an excellent veal reduction, the beef’s melting texture made a good marriage with the young Grey Label. The Chef’s dessert selection is usually accompanied by a Seppelt DP57 Grand Tokay but Debbie convinced us to try a local Botrytis Chardonnay 2004. I like botrytis affected Chardonnay about as much as I like over-oak-chipped cheap Chardonnay, so this took a considerable amount of convincing from Debbie. I have to admit it wasn’t bad after all. Somehow the wine retained its acidity without losing character altogether. Of course by then I was ready to like anything Tim and Debbie put in front of me. Our dessert selection began with a spoonful each of pink grapefruit, peach and strawberry sorbets, followed by a large platter-to-share artfully decorated with a line-up of: a “peanut butter sandwich” consisting of a layer of peanut caramel cream, a layer of chocolate peanut bavarois and topped with an apple/strawberry jelly; a whipped ricotta cannoli with Poire William cream; an orange and cinnamon panna cotta; and a steamed mango pudding with fresh mango. After a head-clearing macchiato with petit fours I had to have a glass of 46-year-old Eau de Vie de Vin de Bourgogne. Call me a pig. I really felt like Oink. The Chef’s Tasting Menu is priced at $75 p/p. With matching wines it’s $110. I see value like this about as often as I eat sun-warmed raspberries off the cane, see a rainbow through a thundercloud over a vineyard and am bitten on the big toe by an extremely rare pig. In the Southern Highlands, no less. Visit the Centennial Vineyards Winery & Restaurant (Centennial Road, Bowral,  4861 8700, www.centennial.net.au) for the largest and most modern winery around. The restaurant is cutting-edge excellent. Mundrakoona Estate Premium Wines (Sir Charles Moses Lane, Old Hume Hwy, Mittagong,  4872 1311, www.mundrakoona.com.au) is unusual in that it includes a working smithy. Great place to visit and the wines are well worth sampling. Craigieburn’s Montfort Restaurant (Centennial Road, Bowral,  4861 1277, www.craigieburnresort.com.au) is far better than the average hotel eatery. Have a drink on the terrace before dinner and soak in the atmosphere. Good place to lay your head when a base for Highlands touring is needed.